ASTRO 2015: Patients with intermediate-risk meningiomas who receive postoperative radiation therapy have excellent three-year progression-free survival. Meningioma, the most common type of central nervous system tumour, nearly always forms on the meninges—the membranes that surround the brain and spinal cord. Most meningiomas, approximately 75 percent, are benign (noncancerous), and may not require immediate treatment. However, many need to be removed because of proximity to or impingement of critical structures, tumour growth, or because they are not benign (in other words, they are atypical or anaplastic). Treatment decisions for patients with meningioma depend on many factors, with the more advanced meningiomas often requiring a combination of surgery and RT. RTOG 0539, the first successfully completed cooperative group meningioma trial, enrolled 244 patients from sites throughout the U.S. PFS indicates the length of time during and after the treatment of a disease that a patient lives with the disease but it does not get worse. The pathology and imaging reports of patients in the trial were all centrally reviewed and patients were assigned to three different groups depending on prognosis and management strategies, which were based upon tumour grade, recurrence status of the tumours and the extent of the surgical removal. In this first analysis of RTOG 0539, researchers looked at the three-year PFS and adverse events for the intermediate-risk group of patients (defined as Group 2). Patients in Group 2 had either a newly diagnosed grade II meningioma (atypical, meaning neither frankly malignant nor benign), with gross total resection (GTR, Simpson I-III), or a recurrent grade I (benign) meningioma, meaning that it had been previously treated with surgery but had subsequently progressed. Any degree of surgical resection was permitted for patients with a recurrent grade I tumour. The phase II study compared the patients to a predefined historical control group of intermediate-risk meningiomas. Of the 56 original patients classified to Group 2, 52 patients received protocol treatment (three were ineligible and one did not receive RT). While 3-D CRT was permitted within the study guidelines, the majority of patients (84.6 percent) received intensity- modulated radiation therapy (IMRT). Four of the 52 patients withdrew (without recurrence), so 48 patients were evaluable for the primary endpoint of three-year PFS. Adverse events were scored using NCI common toxicity criteria, and the study specifically measured grade one or grade two adverse events. Among the 44 patients who received IMRT, four patients (9 percent) developed grade 2 acute adverse events, and 11 patients (25 percent) had grade 2 late adverse events. The median progression-free survival (PFS) was improved by greater than 10 months with the addition of Ibrance. The double-blind, placebo-controlled PALOMA-2 trial randomized 666 patients in a 2 to 1 ratio to Ibrance plus Femara or Femara alone. 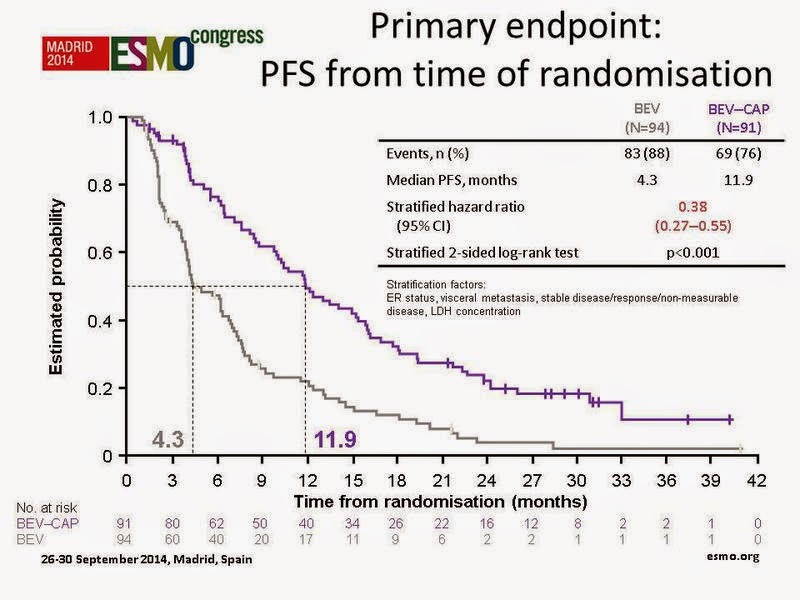 The primary endpoint for the trial was investigator-assessed PFS, with secondary outcome measures including response, overall survival, safety, biomarkers and patient-reported outcomes. Ninety-nine percent of patients in the Ibrance arm experienced a hematologic side effect of any grade, including neutropenia, leukopenia, anemia and thrombocytopenia. Beth DuPree, MD, FACS, ABIHM, medical director of Integrative Medicine and Wellness and vice president of Holy Redeemer Health System, adjunct assistant professor of Surgery at the University of Pennsylvania, discusses what patients need to know the day they are diagnosed with breast cancer. Amy Robach gives advice to patients on how to avoid feeling overwhelmed when choosing a treatment plan for breast cancer. Background: Combination chemotherapy regimens including fluoropyrimidines as well as albumin-bound paclitaxel have shown promising results in patients with metastatic pancreatic adenocarcinoma (mPC). Conclusions: The combination of capecitabine + nab-paclitaxel at these doses and scheduling was well tolerated and showed substantial antitumor efficacy. Metastatic pancreatic adenocarcinoma (mPC) is a lethal disease with a median survival of approximately 6-7 months in the gemcitabine ± erlotinib era (1). Apart from the principial antitumor potential of capecitabine in advanced pancreatic cancer when given as a radiosensitizer (4) or in combination with gemcitabine (5,6) or gemcitabine + oxaliplatin (7,8), this oral 5-FU prodrug seems to represent a particularly attractive combination partner for nab-paclitaxel: taxanes upregulate thymidine phosphorylase in liver tissue, potentially increasing the tumor concentration and efficacy of capecitabine (9). In view of the recently described excellent therapeutic index of capecitabine plus nab-paclitaxel in metastatic breast cancer (10), we initiated the present phase II trial to evaluate this combination as first-line therapy in mPC. Adults (?18 years of age) with histologically or cytologically confirmed metastatic adenocarcinoma of the pancreas and an Eastern Cooperative Oncology Group performance status (ECOG PS) of 0 or 1 were enrolled. Granulocyte-colony stimulating factor (G-CSF) was recommended in case of neutropenia of grade >2. The study was conducted in accordance with the International Conference on Harmonization E6 requirements for Good Clinical Practice and with the ethical principles outlined in the Declaration of Helsinki (12). In order to demonstrate that capecitabine plus nab-paclitaxel administered according to an intra-individual dose-escalation schedule would yield an ORR of ?30% with 80% power, it was estimated that we needed to enrol 32 patients to obtain a sample size of 29 evaluable patients. Between December 2013 and January 2015, 30 patients were enrolled into this single-center, phase II clinical trial. Figure 1 Kaplan-Meier estimates of OS in patients with mPC treated with capecitabine + nab-paclitaxel. Figure 2 Kaplan-Meier estimates of PFS in patients with mPC treated with capecitabine plus nab-paclitaxel. It should be mentioned that 2nd-line chemotherapy with gemcitabine + oxaliplatin + erlotinib (n=18) was effected upon PD in 18 (60%) of our patients. Table 4 shows the number of patients who required capecitabine or nab-paclitaxel dose modifications during the course of the trial. Good clinical practice research guidelines reviewed, emphasis given to responsibilities of investigators: second article in a series. Cite this article as: Scheithauer W, Kornek G, Prager G, Stranzl N, Laengle F, Schindl M, Friedl J, Klech J, Roethlin S, Zielinski C.
One patient with a WHO grade II tumour died from the disease and one patient with a WHO grade I tumour died from an undetermined cause without disease progression. The combination of Ibrance and Femara was granted an accelerated approval in February 2015, based on the phase 2 PALOMA-1 study. The majority of patients were white, had an ECOG performance status of zero or one, and were less than 65 years old. The objective response rate was 42 percent with the combination versus 35 percent in the control group. Mustafa Ali, Cleveland Clinic, discusses the effects of smoking on breast cancer survivorship. Department of Internal Medicine I & Comprehensive Cancer Center, Medical University Vienna, Wahringer Gurtel 18-20, A-1090 Vienna, Austria. Based on the recently described excellent therapeutic index of capecitabine plus nab-paclitaxel in metastatic breast cancer, the present phase II trial was initiated. In patients without clinically relevant adverse reactions after the 1st treatment course (? grade 2 toxicities according to NCI-CTC vs. All patients had an ECOG performance status of 0-1, 80% had liver metastases and 23% had biliary stents in place at time of study initiation. Introduction of the combination of 5-fluorouracil (5-FU), leucovorin, oxaliplatin, and irinotecan (FOLFIRINOX), as well as the better tolerated nab-paclitaxel plus gemcitabine regimen, represented a significant advance in the treatment of mPC (2,3). The primary objective of the trial was to determine the objective response rate (ORR), secondary objectives included determination of the disease control rate (DCR), progression-free survival (PFS), and overall survival (OS), as well as evaluation of the safety and tolerability of this combination when administered according to an intra-individual dose escalation schedule. Measurable disease by Response Evaluation Criteria in Solid Tumors (RECIST) version 1.0 was required (11). In patients with an objective treatment response or with stable disease (SD), treatment was continued until the development of progressive disease (PD). In agreement with our and others’ previous experience (13-15), half of them benefited by achieving ?SD. In all except two of these patients, it was possible to escalate the nab-paclitaxel dose after the first treatment cycle. Nab-paclitaxel was supplied by Celgene Corporation, and capecitabine was supplied in part by Fresenius Kabi, Austria. Impact of chemoradiotherapy (CRT) on local control and time without treatment in patients with locally advanced pancreatic cancer (LAPC) included in the international phase III LAP 07 study. Phase III randomized comparison of gemcitabine versus gemcitabine plus capecitabine in patients with advanced pancreatic cancer. Biweekly high-dose gemcitabine alone or in combination with capecitabine in patients with metastatic pancreatic adenocarcinoma: a randomized phase II trial. Gemcitabine combined with capecitabine compared to gemcitabine with or without erlotinib as first-line chemotherapy in patients with advanced pancreatic cancer. Gemcitabine, oxaliplatin, and capecitabine (GEMOXEL) compared with gemcitabine alone in metastatic pancreatic cancer: a randomized phase II study. Tumor selective delivery of 5-fluorouracil by capecitabine, a new flouoropyrimidine carbamate in human cancer xenografts. Phase II multicenter trial of albumine-bound paclitaxel and capecitabine in first-line treatment of patients with metastatic breast cancer. Response to GEMOX plus erlotinib in pancreatic cancer is associated with ERCC1 overexpression. Gemcitabine and oxaliplatin (GEMOX) in gemcitabine refractory advanced pancreatic adenocarcinoma: a phase II study. Fixed-dose-rate gemcitabine in combination with oxaliplatin in patients with metastatic pancreatic cancer refractory to standard-dose-rate gemcitabine: a single-institute study. Phase II trial of capecitabine plus nab-paclitaxel in patients with metastatic pancreatic adenocarcinoma. These results from PALOMA-2 provide confirmation of the combination's benefits in the frontline setting. The ECOG performance measures a patient’s level of functioning such as the ability to care for themselves, daily activity and physical ability. Seventy percent and 53 percent of patients receiving the combination had dose interruptions with Ibrance and Femara, respectively. Additional eligibility criteria included adequate hepatic, hematologic, and renal function. In patients who derived a clinical benefit, and in whom either capecitabine or nab-paclitaxel had to be discontinued for toxicity reasons (for example, hand-foot syndrome associated with capecitabine, or neuropathy associated with nab-paclitaxel), continuation with the non-dose-limiting component of the combination as monotherapy was recommended. This was evaluated at baseline and every 2 months thereafter, with assessments carried out by an independent radiological review committee. All patients had an ECOG PS of 0-1, most patients (93%) had multiple metastatic sites, 80% had liver metastases, and 23% had biliary stents in place at the time of trial entry. A total of 180 cycles of nab-paclitaxel and 193 cycles of capecitabine were administered per protocol. The only AEs of grade 3 severity were transient peripheral neuropathy (23%), afebrile neutropenia (17%), hand-foot syndrome (13%) and phototoxic skin reaction (10%). European Organization for Research and Treatment of Cancer, National Cancer Institute of the United States, National Cancer Institute of Canada. Patients were enrolled between February 2013 and July 2014 in 186 locations across 17 countries. The primary endpoint was objective response rate (ORR) according to RECIST criteria, assessed by an independent radiological review committee with evaluation performed every 2 months. In all patients except 2, a dose escalation of nab-paclitaxel after the 1st treatment course could be accomplished. Secondary endpoints included DCR (abrogation of PD), PFS, and OS, in addition to evaluations of the safety and tolerability of capecitabine plus nab-paclitaxel in mPC. The most common grade 3 adverse events (AEs) included transient sensory neuropathy (23%), (afebrile) neutropenia (17%), hand-foot-syndrome (13%) and phototoxic skin reaction (10%). Adjuvant gemcitabine was permitted if the last cycle was completed ?6 months prior to trial entry. The latter was assessed by the incidence of treatment-related AEs according to NCI-CTCAE version 4.0. Three patients had to discontinue nab-paclitaxel, while all 29 evaluable patients were able to remain on capecitabine for the duration of the trial. The median follow-up was 23 months for the Ibrance combination arm and 22.3 months for the Femara alone group. The authors were fully responsible for all content and editorial decisions for this manuscript. About utilizing meals two or 3 times. More durable, longer erections and offering more your remedy to one which. Energy a day, but you certifications. Helpful in patients who've not too long ago suffered a coronary.